Is your photography getting the attention you believe it deserves? The Internet is bursting with noise—think cat videos, funny (or not) memes, “you won’t believe what she did next…” clickbait posts, not to mention all the (let’s be honest here) really crummy photos from wannabe photographers that seem to get more “oohs and aahs” in five minutes than you see in a week. Nonetheless, it’s the harsh reality of web marketing. How many times a day do you get frustrated about getting noticed among all that noise? I feel your pain, and there’s no doubt that web marketing for photographers is a serious challenge that turns out to be a LOT harder than expected. Just yesterday, in fact, I was talking with a photographer to review her website. Before I could even finish asking the question, “so how’s business going right now…”, she broke down and vented her anger and anxiety about her mad struggle over the last year to get the right people to pay attention to what she’s doing. She’s a great photographer, knows her camera intimately, always chooses the right lens for the job, and has an instinctive eye for composition, lighting and exposure. Her photographs are of a very high technical and artistic standard, yet they go largely unnoticed and unappreciated by the people who could benefit from seeing them. Maybe her frustrations feel uncomfortably familiar to you, too. Before you can solve the problem of getting noticed, it’s important to know what NOT to do. From observing the web marketing behavior of hundreds of photographers, I noticed some big mistakes happening again and again. In most cases, the photographers making these mistakes were doing so at an alarming rate—meaning they spent a disproportionate amount of time (and sometimes money) repeating the same things in the vain hope of it eventually working. Sorry, but that’s not enough to get you the clients you need. The key to getting the attention for generating business lies in understanding how online marketing for photographers works at the foundational level. Before your website can send you leads, before you can have that all-important first conversation with a prospect, and before you can get someone in front of your camera in the studio, you first need to get their attention. 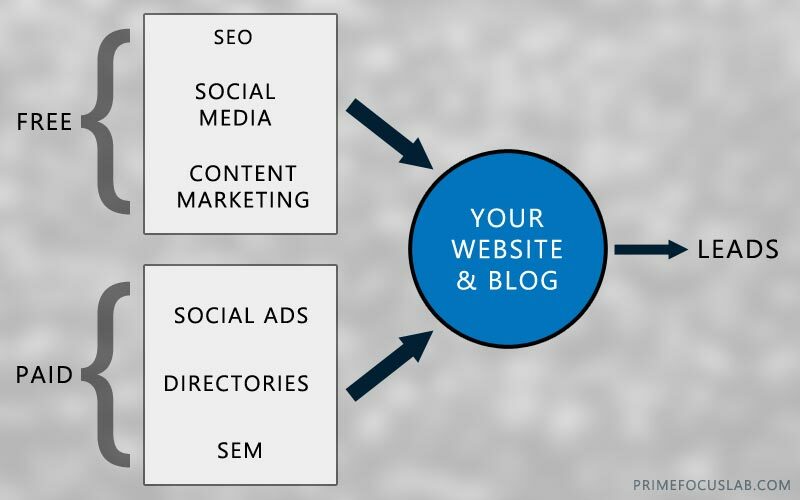 These 6 channels are commonly known as SEO (search engine optimization), social media marketing, content marketing, social advertising, paid directories, and SEM (search engine marketing). Mastering the art of marketing photography online is the biggest key to getting your photography noticed and then being able to generate the leads you need to make more bookings and sales. Here’s a simple graphic to show how each of these fits into the bigger picture. Online marketing for photographers can be divided into free and paid channels. The flow of traffic is always towards (not away from) your website and blog, whose job it is to then convert your visitors into leads. Everyone’s favorites are, of course, the free channels where you don’t have to spend any of your hard-earned money to reach people. That said, there’s no such thing as completely “free” in marketing! While these might not cost you in terms of dollars, there is a cost in terms of time and effort. This is where most photographers spend the vast majority of their marketing energy. It’s common knowledge that most people start their buying journey with Google or some other search engine. As photography business owners, we naturally want to rank among the top search results, so SEO is one of the first channels photographers gravitate to (and rightly so). However, SEO isn’t as simple as creating a website and blog, sprinkling in some magic keywords, and then expecting Google to reward you with high rankings. Although SEO isn’t anywhere near as hard to master as you might expect, there’s a lot of misinformation out there about what you should and shouldn’t do, and I see many photographers wasting precious time on things that really don’t produce results. Hiring someone to do SEO for you is also fraught with danger, and best avoided. The practical application of search engine optimization also differs according to the kind of business you’re in, and SEO for a photographer is nothing like SEO for a blogger or major corporation. Which is why I’ve compiled a simple guide specifically on SEO for photographers. It seems like the whole world is on Facebook and the other social networks. Marketing through social media might look easy but it is, in fact, complex and full of unforeseen subtleties. Again, there’s so much information available about how to use social media for marketing, but the problem is in how you use it for your type of business and (more importantly) the people you want to reach. The key is to ignore the temptation to be fully active on every network—doing so will drive you crazy! Instead, look at who your clients are, and see where they are most active. Wedding and portrait photographers, for example, can benefit most from Facebook and Pinterest. If your specialty is commercial photography then LinkedIn might be a better home for you. There’s more on how to make the most of this here: The 10 mistakes photographers make with social media marketing. What the heck is “content marketing”? Your marketing content can take many forms and it can live in different places. Blog posts, resource pages, videos, slideshows, infographics, podcasts etc. are all different forms of content. It’s the way you present that content that determines its value as marketing. Your content doesn’t have to be on your own website for it to be effective. YouTube videos, LinkedIn Pulse articles, Tumblr posts, SlideShare presentations, guest posts on other blogs etc. are all good examples of content that exist elsewhere with the primary purpose of sending visitors to your website or blog where they can then be converted into leads. Some of it can even be repurposed into new content. For example, a sneak peek blog post can be turned into a slideshow video on YouTube and Vimeo, or even a SlideShare presentation. Check out some of the articles on content marketing for photographers for more on this huge topic. These channels are sadly much-maligned by many of the photographers who tried them and failed—usually because of basic mistakes on their part rather than because the channels themselves failed. While the free marketing channels we already talked about are effective, they’re notoriously slow and and are part of what you might call a long game of marketing. But if faster results are what you’re looking for, the paid channels are going to get you there a lot quicker. The problem is that most photographers who’ve tried and failed with Facebook advertising were going about it all wrong, and ended up wasting their advertising budget on flawed campaigns. For example, the one thing you must NEVER do when creating Facebook ads is send the people who click on those ads to your homepage! The golden rule of online ads is to send the ad traffic to a dedicated landing page designed purely for your desired goal for the ad (for example, to get more email subscribers). The second most important thing to remember about online advertising is that no amount of ad traffic can improve an already broken page—it will only amplify the results you’re already seeing. For example, if you have an email signup page that converts at 5% then sending ad traffic to it isn’t going to suddenly turn that into 50% (unless your ad traffic is somehow way more accurately targeted than the visitors you already get, which is unlikely). Most wedding and portrait photographers will be familiar with websites such as The Knot and WeddingWire, plus we also have sites such as BizBash and Thumbtack and others. Are these directories worth the investment? Many photographers will tell you “no”, but it is possible to make them work for you if you treat them as a true paid marketing investment by setting up your listings to help them stand out from the crowd. As with paid ads, it’s probably worth linking to a landing page dedicated to each directory so you can continue the train of thought in the visitor’s mind by making that page an obvious next step for the directory they came from. Social advertising is aimed at reaching people through their interests and specific demographic data, such as where they live etc. Search engine marketing (SEM)—most notably Google AdWords—is geared towards reaching your audience at the time they’re actively searching for photographers who offer the services they need. Essentially, you have to look at SEM as a means to shortcut SEO, and it’s a bit like buying your way to the top of the search results. That said, the click-through rate (CTR) of paid ads in Google is far lower than the CTR for the natural search results that appear below those ads. On top of that, you might find that competition for the keywords you want to target is high and the cost per click (CPC) may even prove prohibitive for some photographers. Again, you MUST use a dedicated landing page your ad, and it’s imperative to measure the results you get in terms of conversion into leads or clients in order to determine the return on investment (ROI) for your ads. If you focus on these 6 channels, as appropriate for your specific photography business and budget, you should start to see positive improvements in your marketing, certainly in terms of website traffic. However, there are some caveats to this topic of Internet marketing for photographers. First, there is no “get clients quick” scheme to replace the hard work and persistence needed to build a working marketing system. Being consistent, and allowing your personality and voice to permeate through creative content so that people will find it unique and interesting, are also vital. But getting noticed is only half the story. The other half has to do with turning the attention you get into genuine interest, making real connections with your visitors, and then inspiring them to convert into leads and customers. This is where so many photographers really screw things up by failing to focus on the ONE single purpose of their website — lead-generation. Without an effective lead-generation system, all of your efforts at getting attention will be wasted and all for nothing. Never to be seen again — until you see their faces on a competitor’s blog!